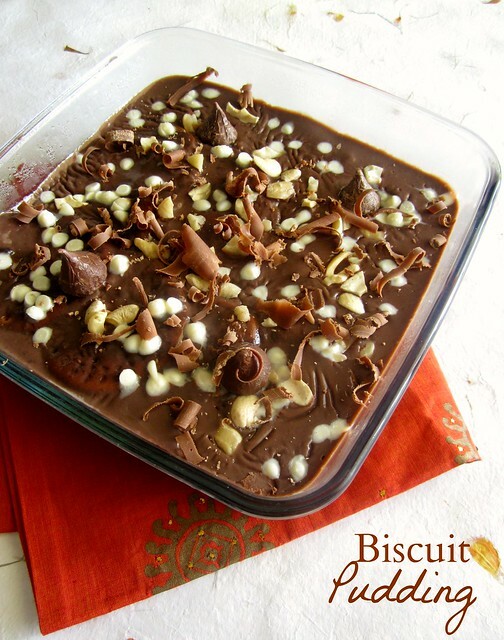 Easycooking: Biscuit Pudding ~ Amma's special! I first heard about this pudding from a good friend KK.I remember so well,he said he had tasted a yummy pudding made by his friend S and it was simply out of this world.I asked him about the ingredients and he said it had Marie biscuits and chocolate sauce.Well,I was not going to attempt this just with his suggestions so I dropped the idea and completely forgot about this.Thank God for small mercies-call it co-incidence or anything,S happened to be my hubby's first cousin! !Can it get more merrier than that? I decided to ask S for the recipe first thing when I met her.I was casually telling amma(m-i-l) about this and she asked-"you mean chocolate pudding with marie biscuits?,I make it quite often,in fact S actually follows my recipe"...WOW!! !She made it for me the very next day and I almost finished off half of it.It tasted simply divine..Yummy!!! 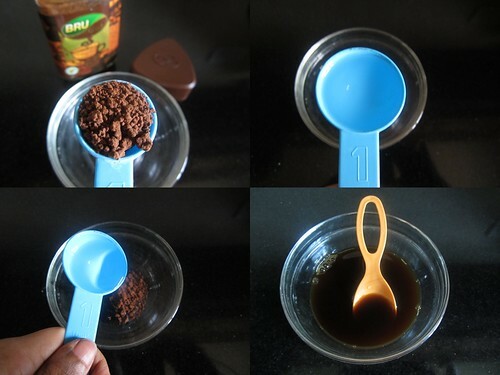 Make the coffee dipping liquid.Instant coffee mixed with hot water. Dip the marie biscuits in coffee decoction(both sides) and layer them in a serving bowl. Finish the whole packet this way. Mix together the cornflour and cocoa powder in a bowl.Add about 1/4 cup of cold milk and make a smooth lump-free paste.Reserve. 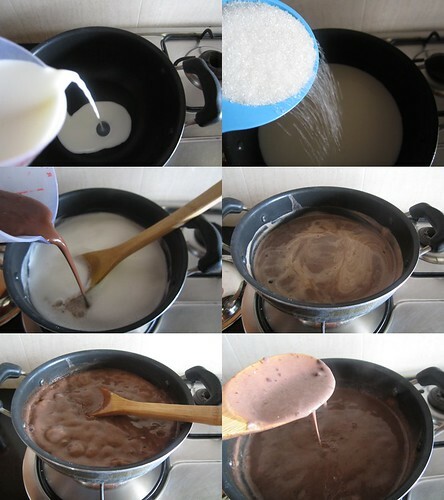 In a pan,boil the milk and add sugar. 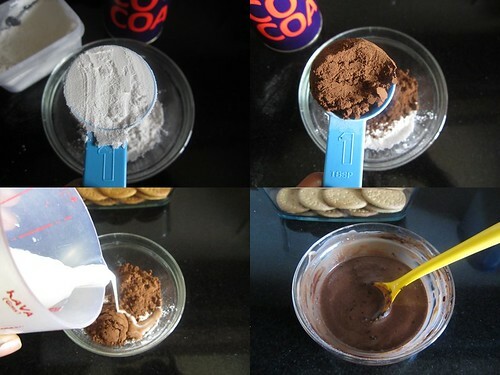 When the milk boils,add this cocoa-cornflour paste and mix well. It will start thickening immediately,keep stirring. Switch off the flame when it thickens,but still of pouring consistency(similar to custard).While still hot,pour it over the biscuits and cover the biscuits all over with this sauce. Refrigerate for 4-5 hours and serve chilled!! Wishing you a very Happy Birthday Ma..!!! 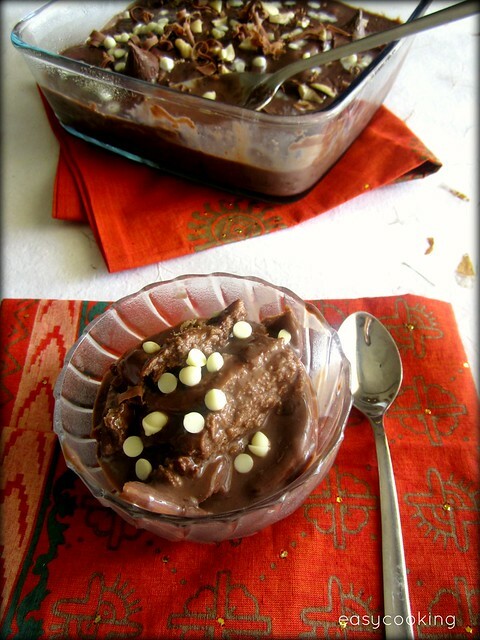 lovely pudding..i have few such bookmarked recipes..havent tried yet.. Happy B'day to your Mil. Biscuit pudding looks yum yum. I've had a different version at a friends place & never bothered to ask the recipe & have lost contact with her....But know it tasted heavenly! this looks easy nd yummy,,,thnks for sharin,..
That sure looks great...many many happy returns of the day to your mom! Thats an easy and it looks delicious too. Birthday wishes to ur mom. Wow lovely recipe dear... I remember making ice cream with marie biscuits and milk when kid!!! lovely pudding with marie buscuits! Thats one easy pudding. Looks delicious. I've tasted this - quite nice. Your post brought back good memories. Sowmya..thanks! !Try it out,ver easy and tasty too.Checked out your zebra cake..yummy!! Thank you all for your lovely wishes for ma-in-law! !Shall convey all your wishes to her!! hey,in ur biscuit pudding post.The second photo seems to be a multiple photos in one image.How did u make it? Can u tell me link which explains in clearly?Did u use phtoshop cs3? Vimala..thank you.No,I still have not installed Photoshop,I did that using Picasa.You can download picasa through google. fantastic and lovely pudding Divya.coffee must be adding a great flavour to it.Bookmarked. Divu, lucky to hv got a link to this frm today's post! I was on vacation n missed this yum looking treat! Tks to ur mom n U for sharing ..my kiddos wd freak on this for sure! Parul,try adding small portions of the same into the milk.Maybe add 1 tbsp at a time and give a good stir.I hope you get it right! Hi Divya!! This seems to be a very interesting & a simple to do recipe. Will try it out. I tried this quick and easy recipe this weekend and it was a big hit. We all liked it a lot :). Its definitely a keeper!!! Tried the biscuit pudding. Lovely. Tried the biscuit pudding recipe and came out really well. Really awesome and simple.. Both me and my husband loved it.. Awesome pudding!! I have also tried ur cookies, date-walnut was the best. Good work!! 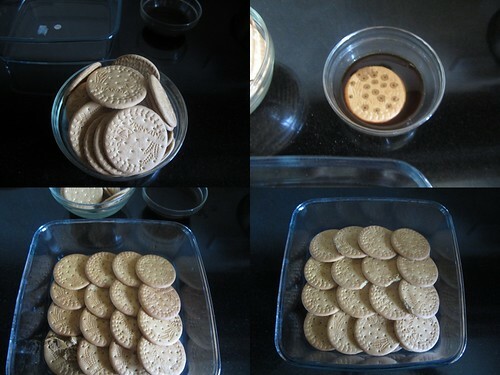 DIPPING THE BISCUITS IN DECOTION IS MUST? I've seen recipes where you dip the biscuits in milk,so if you don't want coffee flavor,go ahead with milk! We used to make something really similar in our school days! I studied in a boarding school in dehradun: full of rules, and we weren't allowed b'day cakes! SO, we saved all our morning biscuits (we got these really yummy biscuits with milk in the morning), dip them in illegally-sneaked in coffee decoction (EXACTLY!) and layer them in someone's tiffin, after which we would layer it with chocolate fudge and last weekend's saved up dairy milks and kitkats! Hi Divya, I came across your blog as I searched for simple recipes. I am completely ignorant in cooking matters, yet I have become an addict of your blog and look forward to your emails due to the simplicity of methods described. I was extremely excited when I saw this recipe as it certainly looked really delicious yet simple. I tried this recipe two days ago. Unfortunately the pudding I made was really, really watery. I am not sure where I went wrong. Can you please advise? Great job on maintaining this blog, Divya :)!! Thanks, Divya. Hi Joyce,thank you for the lovely words of encouragement.So sorry to hear the pudding recipe didn't work for you.Pudding becoming watery could be because of three reasons-did you use full fat milk?did you add the said amount of cornflour and did you cook it for the time specified?I am sure you will get it right,keep trying! I tried this out! So yummy and easy to make.Thanks for the lovely recipe! i jst made it today.. it is really nice.. recommending for everyone .. !! 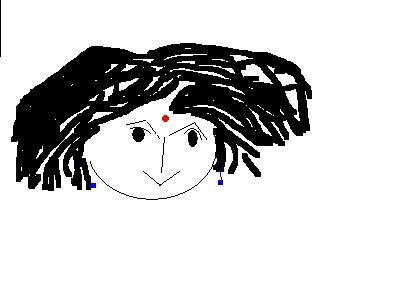 Hey Divya, This is Zarine, Ajay's classmate from school, if you remember I had written a while back here:-) I made this three times in a row and it was a big hit. It even reminded me of tiramisu! (I know it sounds like a stretch). Once I made the mistake of cooling it in the fridge overnight and it was a bit dry, but still very good. Please do pass on my warm regards to Ajay! Ajay says a BIG Hi to you too! 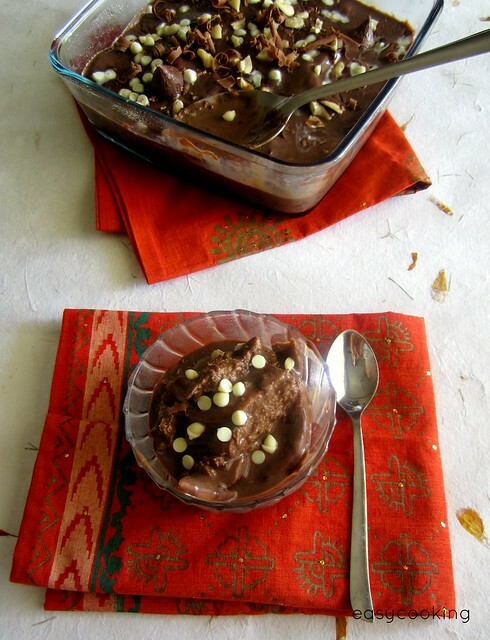 Lovely,I had this pudding a long time back,and since then, had been on the lookout for this recipe.Thank you. Not setting well is I am assuming not jiggly enough,right?Is the pudding still liquidy after refrigeration?It could be either because of the lesser quantity of cornflour used or lesser time of cooking after you add the cornflour mix to the milk. I made this just now.. Eagerly wanted to post about it. It really turned out to be very tasty, and very easy to make. Hats off to you Divya..! I use normal pasteurized milk,2% fat.Yes the recipe requires 500 ml milk of which you should set aside around 1/4 cup milk before boiling and mix that with the cocoa-cornflour and make a paste.Hope this helps! sema recipe ! u decorated well ! Such an easy recipe and looks so yummy !! 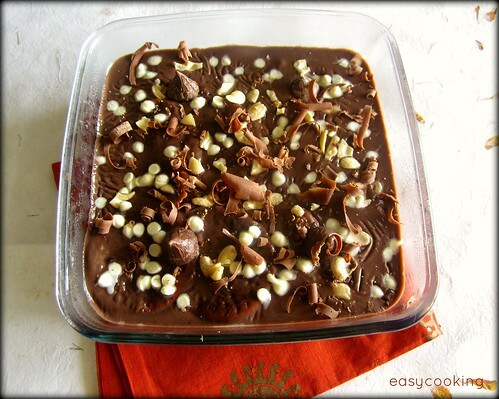 This is really a crowd pleaser and so easy to make too…thanks for sharing !! Thanks a ton. It turned out to be yummy. Everyone at home loved it..thanks for sharing this easy n yummy recipe. I tried it today.n turned out very yummy..the best thing is ingredients r alwz available at home..i alwz followir recipes..i wish ther was an option to post the pic of my pudding ...thnk u divya.. Thank you divya..i searched for various biscuit pudings in net.bt many needed cream wch i din hav handy or butter ..came across urs wch was very easy n i tried as well..it came out so well..